When Ledger was first cast into the role of The Joker, a lot of critics didn't think that he could possibly fill the big boots of previous Jokers, such as Cesar Romero and Jack Nicholson. But, if there is one thing that the Batman films taught me after Batman Begins, it was: Trust Christopher Nolan. 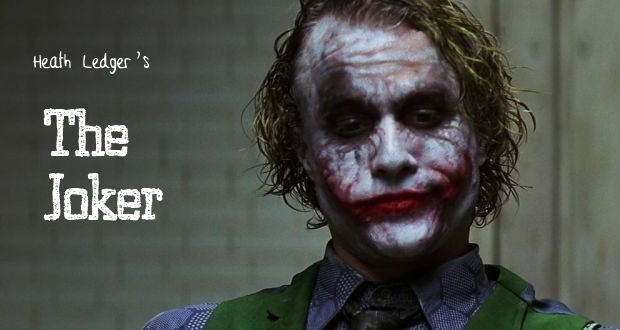 And I did, and Heath Ledger did not fail to impress in the role that he so rightly deserved. I'm a huge believer that this was always going to be the start of big things for Ledger, it's just a shame he never saw the chance to see it for himself. When the original Batman TV series was created, the world of television was a completely different place. And as someone who was born just under twenty years after they were made, I find it difficult to watch them with a straight face. The whole concept was simple, down to the action sequences, the outfits and of course the make up. 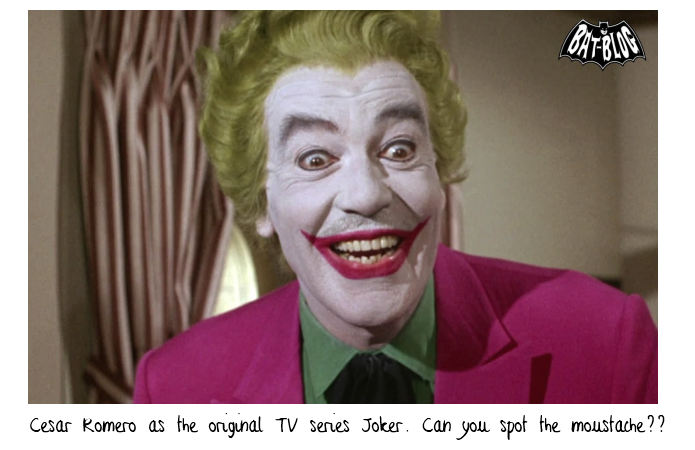 You probably couldn't get more simple than Cesar Romero's make up, who I can imagine probably didn't spend that long in the Make Up Department each morning putting his slap on. In fact, I think it's fairly certain that the biggest challenge for the Make Up Artists, was probably hiding his lovely moustache. Rumour had is that Romero refused to shave his moustache, and so the Make Up Team were forced to hide it as best they could! 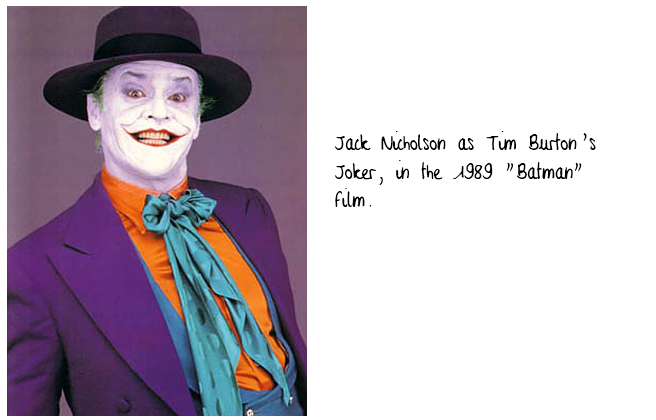 Flash forward to the late 1980's when Tim Burton made his first "Batman" film, and Jack Nicholson's Joker was very similar to Cesar Romero's, however, he was somewhat "tidier". Whilst Romero's make up looked like it had been slapped on in ten minutes flat, Nicholson's make up looked more like a neatly choreographed painting. It certainly feels like a smarter version of the original idea, but with more attention to detail. 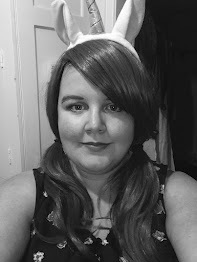 There is of course the continued emphasis on the huge clown-type mouth, with the use of make up creating a much wider mouth type of look that is more creepy than the typical Circus Clown. The above teaser really gave very little of Ledger's make up away. 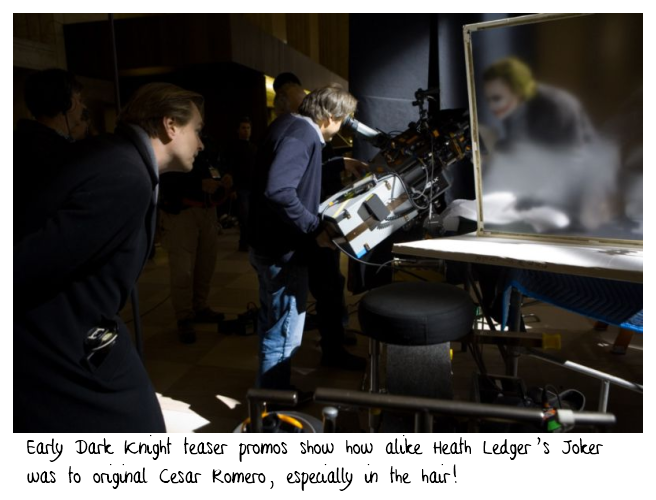 However, it is undeniable, focusing on the hair alone, that can be seen through the frosted glass, that Nolan had taken great inspiration from Cesar Romero's original get-up, as it became evident that the hair would remain the same, as would the overall concept of the clown face. The idea of creating a look where the clown face is an extension of some very sinister-looking scars is a very dark one. It gives more depth to a character who already has so many question marks around his head. Of course the scars create plenty of questions, and offer no answers, because each suggestion that the character offers completely contradicts another story he has already told. Nevertheless, if that alone is not a perfect example of how incredible the make up and prosthetics used on the Batman films really is, then I don't know what is! 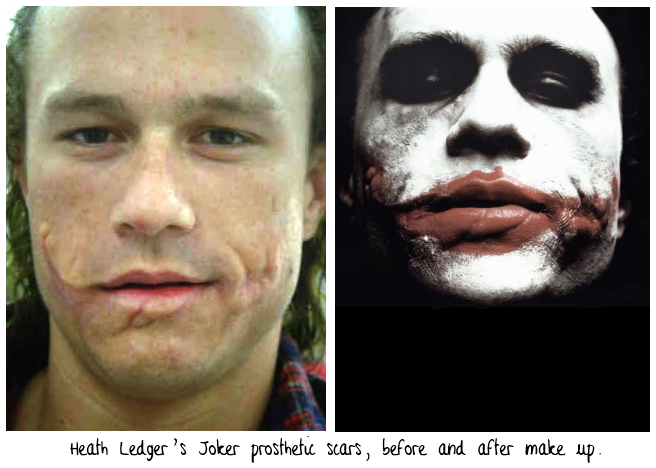 Just looking at the above image, of Ledger with the prosthetics alone, and no make up, it's hard to believe that it is just pretend. He really looks like he has scars, and it's strange to look at. One of the things that I love the most about Heath Ledger's make up, is that even though you know that almost every little detail has probably been planned meticulously, in a way to create the desired look, by the Make Up Artists. It still has this sense messiness and the feel of self-application, as if The Joker got up that morning, and I can imagine him standing in front of a dirty mirror, inside a cockroach-infested bathroom manically applying this make up. His aim? Who knows. But the effect is so befitting to the psychopath that Christopher Nolan and Heath Ledger created so beautifully. For me, Heath Ledger will always be the perfect Joker, especially in the make up sense. I know that a lot of Stalwart Batman fans prefer Romero and/or Nicholson, but I'm not a fan of the originals. I think they look out-of-date and more a symbol of the time period that they were created in. That was of course fine in the sixties and eighties, and Ledger is the perfect example of how it should be done in the noughties, and personally I find this one so creepily more appealing. Which Joker do you prefer? And how do you think they did with Heath Ledger's make up? Did it work? How might you have done it differently?